Swiss Tech Micro Slim 8-in-1 key ring tool kit has 3 screwdrivers, 2 knife blades, flat wrench, bottle opener and nail file. It is made of solid stainless steel. It is compact and lightweight and locks securely on the key ring. The new Micro-Max 19-in-1 Series offers the most comprehensive and versatile set of tools to date. This solid stainless steel tool set, with its patented, quick-release and self-locking mechanism, folds out into 19 different professional-grade tools. Tighten, loosen, wire, drill, file, open and measure with ease. Includes 2 hex wrenches, 6 screwdrivers, pliers, wire cutter, wire stripper, wire crimper, hand drill, file, bottle opener, 2 rulers (mm and inch), and 2 ruler extensions. Patent pending design provides 24/7 pocket-sized readiness. For key ring, purse, glove box and more. Swivel Tool 8-in-1 have forged a strong reputation for precision crafted, high quality, extremely durable designs at key impulse price points. The new, 8-in-1 swivel tool offers an LED flashlight, bottle opener, flat and phillips screwdrivers, knife blade, nail file, nail cleaner. 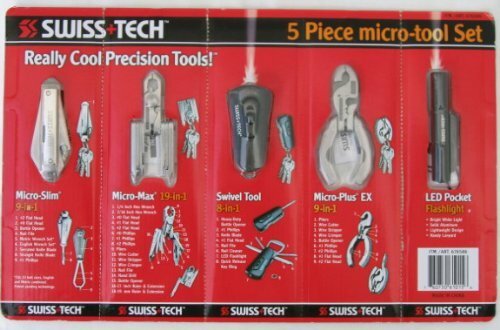 Swiss Tech Micro Plus EX 9-in-1 tool kit has 2 flat, 2 Phillips screwdrivers, pliers, wire cutter, wire stripper, wire crimper and bottle opener. It is made out of solid stainless steel. Screwdriver tips meet ANSI Standards. It has a patented quick release mechanism. It securely locks onto key ring. Swiss+Tech Led Pocket Flashlight - Compact convenience packed into a slimline, bright white flashlight. Effortless pushbutton control operates with click-action ease. Precision-crafted, high grade aluminum construction. Replaceable AAA battery included. Use lanyard on wrist or to hang flashlight for working and easy-to-locate storage. Back end push button control. Unique, flattened surfaces provide comfortable and secure grip. Swiss+Tech brand tools have for many years forged a strong reputation for precision crafted, high quality, extremely durable designs.